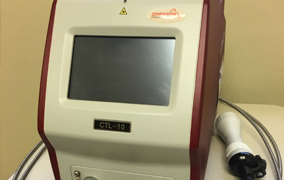 Laser therapy is a painless and drug-free tool that successfully treats many common conditions seen at our clinic. 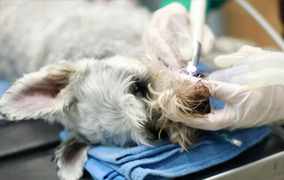 At Belle Chasse Veterinary Clinic, we understand that you want to keep you pet healthy as long as possible, and veterinary dental care is one of the most important factors for the longevity of your pet. 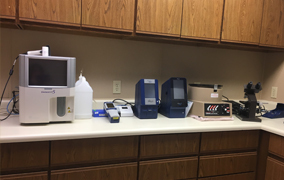 One of the most important tools for veterinarians today is blood work and diagnostic testing and we at Belle Chasse Veterinary Clinic have the equipment to test these in-house. Established as a small animal clinic in the 1970s, the Belle Chasse Veterinary Clinic has been owned and operated by Dr. Carol Duplechain since 1985. Our clinic provides quality, comprehensive health care to pets in Belle Chasse, Terrytown, Gretna, and the surrounding areas of south Louisiana. Our knowledgeable veterinarians have many years of combined experience in preventative healthcare, as well as in diagnosing and treating illness and disease. Our cutting-edge practice includes the latest in veterinary technology, which aids our doctors in providing the best care available for your pet. • Our clinic has an advanced diagnostic laboratory and digital x-ray system that enables quick and accurate assessment of our patients, meaning that treatment can begin immediately if necessary. Our surgical suite includes the latest in monitoring equipment and surgical tools to assist our veterinarians in providing the best possible care for your pet. • Pain prevention and management are one of the primary goals for our patients at Belle Chasse Veterinary Clinic, since our caring veterinarians understand that our animal friends feel pain in much the same way as people do. Our caring doctors prevent and treat pain with the safest and most effective methods available, as well as provide laser therapy for certain chronic painful issues. • We promote dental care to prevent or treat periodontal disease, dermatology assessments and treatments for pets suffering from skin issues, and nutritional counseling to ensure pets receive the proper food in appropriate portions based on their age and condition. • Microchipping of pets is always recommended so that your cherished pet will have a form of permanent identification that will give them a greater opportunity to be returned home in the event they become lost. •Our clinic also offers a comprehensive pharmacy, complete with competitively priced products that are guaranteed by the manufacturer of the medication. At Belle Chasse Veterinary Clinic, we understand you have a choice about where you take your family pet for care. Our compassionate and experienced veterinarians, advanced tools and equipment, and competitive pricing make our clinic the leader in the Belle Chasse area for veterinary care. Allow us to provide quality and compassionate care for the life of your pet and schedule an appointment with us today. At the Belle Chasse Veterinary Clinic, we provide veterinary services with love and concern for our patients and a family atmosphere for their owners.